CAMPUS CASH GOES TO TOWN! Off-campus purchases will appear in your online account statement (via the new GET website), so you’ll be able to review your transactions just as you can with on-campus purchases. And since you can instantly suspend your card if it is lost or stolen, your money is always safe. Faculty and Staff: If you're interested in setting up a Campus Cash account, click here for more information. We are currently recruiting merchants to join this exciting new program and expect the list below to grow. Please check back often for updates. We would also like to hear your thoughts about which merchants you’d like to see accept Campus Cash. 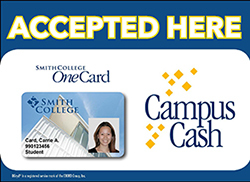 Please email us at onecard@smith.edu with your ideas. Thanks!